As blog readers know, I love to sketch on location. But to be honest, you can’t be sketching from life all the time. It’s demanding – constantly getting to new places. Deciding where to go, finding the time, schlepping your gear. All the little travel expenses. But that’s my personal flaw (and my motivating passion) as an artist. I’m addicted to the new. Always wanting to find the next exciting place to discover through drawing. Or wanting to return to a well known place, and see it with a new technique. But on the occasions where I’m trapped by circumstance, not able to go exploring – well, most of the time I’ll end up drawing people. People are an endless subject – we’re always doing something. At those times – when the weather is bad, or you’re on a long flight – or you’re in bed with the flu – any time when you have nothing to sketch from – maybe then you can go back to sketching from your imagination. Like maybe you used to do when you were a kid? Only now, as a more mature artist, I like to think the sketches are informed by what we’ve drawn out in the world. All the observation in museums and greenhouses and on the street is stored up in the data banks. So when I go to draw from imagination, it’s a mix of visualizing an idea and drawing from memory. 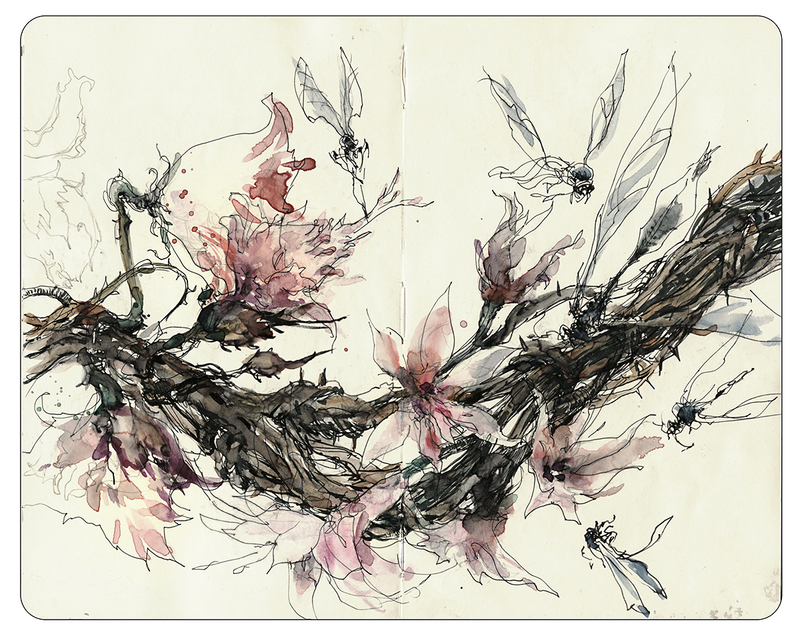 I have one moleskine dedicated to these imagination drawings. (You know me, I have to keep my sketchbooks strictly compartmentalized. No mixing subjects!) 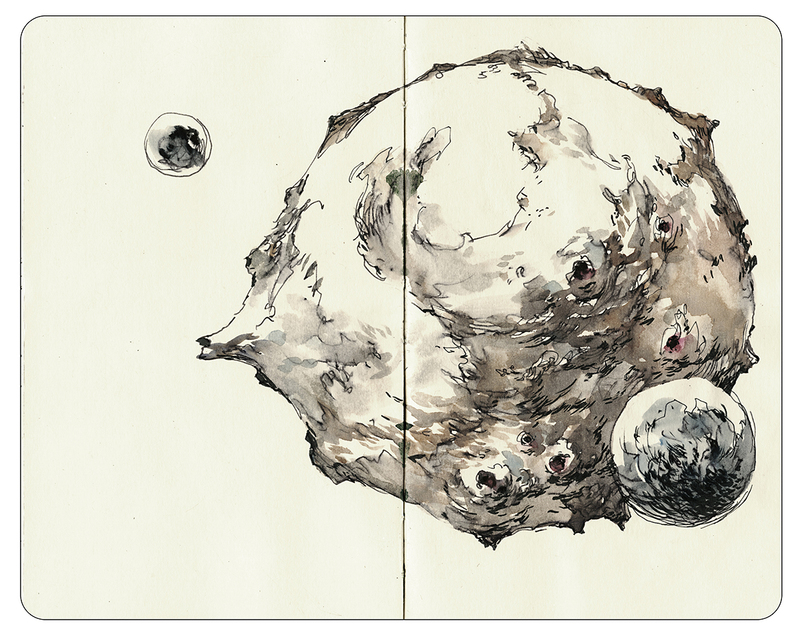 This little book is very very slowly getting filled with these alien worlds and fantasy characters. This is a long term application of what I call ‘knitting’. That is – slowly finishing a sketch. Scribbling down something while you’re ‘seeing’ it (I’ll brainstorm ideas in pencil). 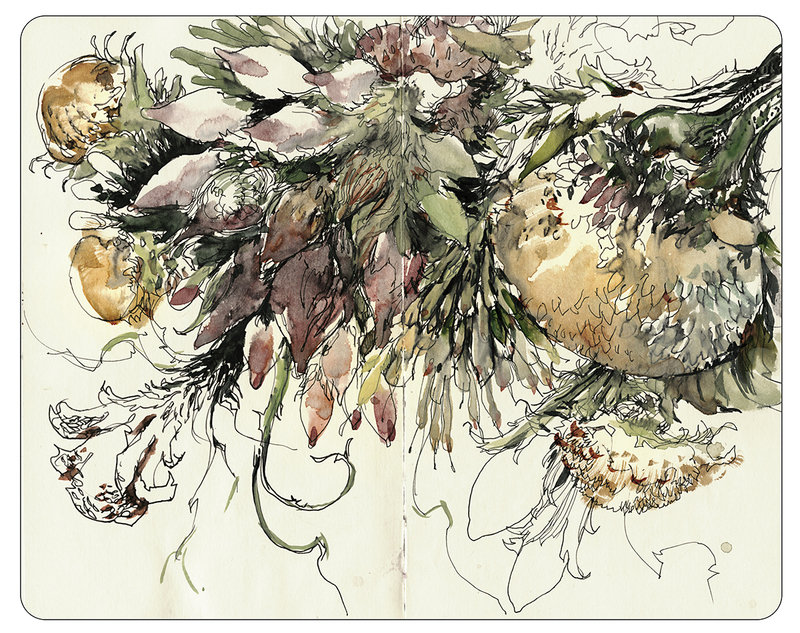 And then detailing up things like surface texture and foliage gradually in ink. Working ten minutes waiting for lunch, five minutes more standing in line at the bank. Some of these drawings took months start to finish, but only a hour or two total. So – sketching from imagination! It’s a different kind of travelogue! Maybe some of you have a secret sketchbook like this? If you post any of your drawings from the imagination somewhere – let me know in the comments. I’d like to see some of your interior journeys. I have a question about your sketches though, it looks like you’re doing them in a normal moleskine sketchbook but then I see they’re coloured with watercolours, how do you manage to do that? I found it impossible to apply watercolour to those pages! Yes, that’s a normal moleskine – with the heavy waxy pages. Yes, watercolor is a bit weird on that paper – it resists like wax paper. But I kind of like it actually. You get weird little bubbles and hard edges that add some interest. I’m also using some water soluble ink in the drawings, so that gives everything that neutral tint. I adore the first one! Colors and shapes – love it all! I absolutely need to do this more. Thanks for the inspiration! You seem quite dedicated to your One Sketch A Day blog! With that energy I’m sure you can fit in another project :):) It’s funny how we have some many small motivational games. But whatever works hey! Love the idea! And your drawings from imagination look so real! 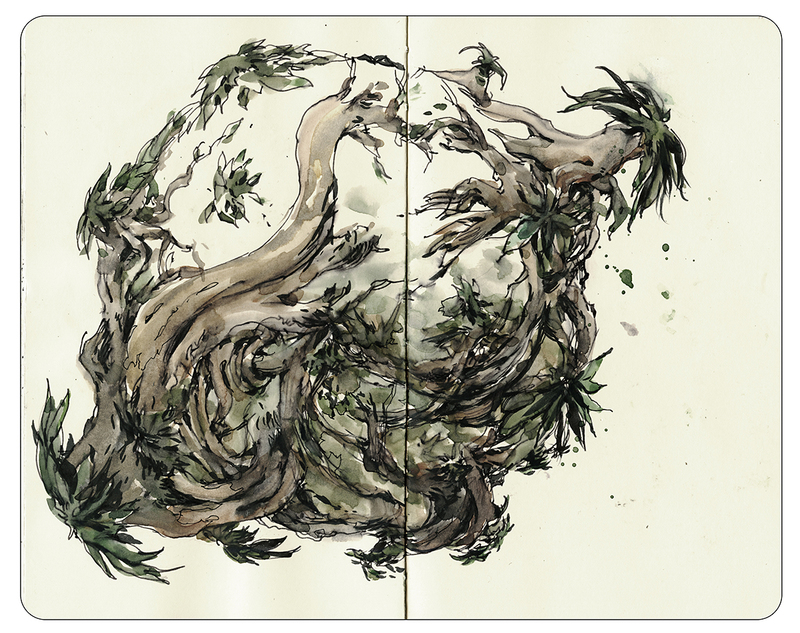 The last drawing reminds me of the Little Prince and the baobabs. And yes! I was thinking of the Little Prince for sure. These are absolutely stunning! I used to draw from the imagination a lot, but lately I’ve rather got used to drawing ‘things’ – this has inspired me to go back there. Many thanks. Think its time to try this….going stir crazy…BYTW I LOVE Marc’s sketching…and his classes at craftsy are great too! Very interesting! (especially the figure) – see that’s something where our knowledge and imagination combine. Can’t be seen in real life only in the imagination. Sketching from the imagination is great and I really like your compositions. I’ve also been following Nina Johansson’s series on fantasy sketches and enjoy the departure she has taken from urban sketching. Not to say that there’s anything wrong with urban sketching, but variety and exploration are part and parcel of the creative process. For instance, I like to sketch from photos I’ve taken. Sure, I might notice more details if I sketched plein aire, but I ‘m not comfortable sketching in public and I don’t have enough time to devote to sketching on location. So photos work for me but just the same I’ll never limit myself to only sketching from photos. What I think I’m trying to say is that variety is a good teacher; it may open up opportunities that you’ve been ignoring, or it may confirm things that don’t work for you. Thanks for your posting (and for your patience in reading my rambling reply). In fact, it was talking to Nina in Singapore that reminded me to spend a bit more time with this book! She mentioned she was doing drawings from imagination, and I was somewhat shocked! Really! Is that allowed as an Urban Sketcher! Hah – it’s funny how my mind very easily becomes rigid :) I am a guy who likes to follow rules – so it has been a conscious effort to make my rule be “the first rule is there are no rules”. These are quite exquisite and some remind me a little of something out of the Voynich manuscript. I’ve spent so long teaching myself to observe , measure and study that I’m curious to see what my pen might pull out of my imagination, again. I guess I was having a bit of a bah humbug day, but here’s the anti-Santa that came out! https://susancornelis.wordpress.com/2015/12/09/yeah-right/ Your post was good timing for the cold/rainy/dark season that is upon us! Now, I’m sure you say somewhere – but I’d love to hear what’s up with your cycling drawings! This is clearly a fascination for you :) Did you get into that purely from an artistic view, or do you cycle yourself? Do you do these from life? Or from tv coverage? Just curious. 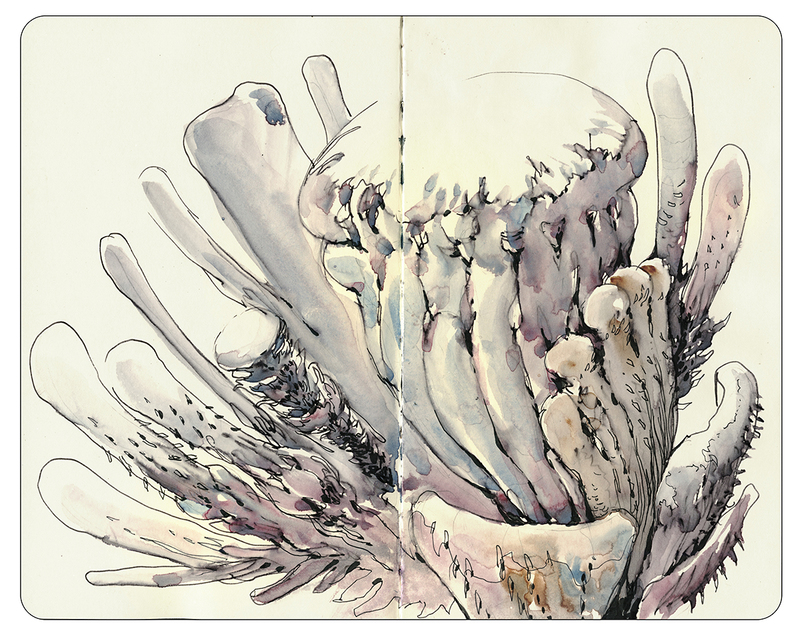 This drawings are wonderful, love the melting line blending with the watercolor! That is fascinating! We both are drawing planets. Interesting how people’s brains are similar all over the world.